Samford University’s Howard College of Arts and Sciences presented approximately 200 undergraduate and graduate degrees May 14, including degrees for two women who completed their work decades after they began it. Samford President Andrew Westmoreland made special mention of Lottie Jacks, who received the Bachelor of Science degree she began in 1948, and Elois Ewart, who this year earned the three credits remaining for the Associate Degree she began in 1944. Westmoreland also presented to Howard College of Arts and Sciences graduates two of the university’s top honors. Journalism and mass communication major Lauren Elizabeth Sims of Trenton, Georgia, earned the John C. Pittman Spirit Award, which honors the 1944 alumnus who served on the university’s board of trustees for 62 years. Pittman’s nephew, Randy Pittman, Samford’s vice president for university advancement, was present to help honor Sims for consistently exhibiting exceptional Christian character in community life. Classics major and University Fellows honor student Samuel T. Hahn of Siloam Springs, Arkansas, earned the President’s Cup, Samford’s valedictorian honor. Hahn was a Rhodes Scholar finalist earlier this year, and recently was named one of 10 students in the nation accepted to the prestigious Lilly Graduate Fellows Program. 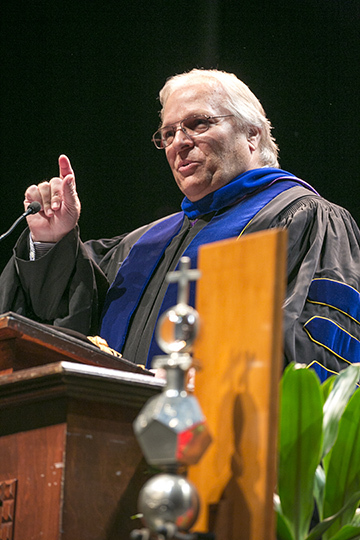 Dr. William F. Warren, Landrum P. Leavell II chair and director of the Center for New Testament Textual Studies at New Orleans Baptist Theological Seminary, presented the commencement address.